The term "big screen TV" has changed over the years. It used to be having a 42 in projection TV in your basement meant you were the king of sporting events, but now 42 inches is on the small end of the HDTVs you see at Best Buy. Televisions are getting bigger, thinner and cheaper with picture quality that rivals the cinema. But what if you could make a TV any size you want? 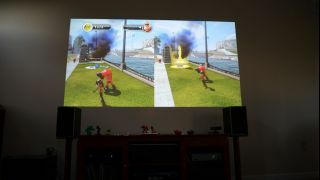 What if you could play videogames at 100 or 150 inches on the wall of your living room for the same price as an HDTV? That's exactly where home cinema projectors come into play. I've been demoing the Epson Home Cinema 8350 for the past month and it's made me seriously consider ditching my living room TV. In a previous home I had actually built a home theater room in the basement, complete with screen and projector. The one "problem" I always had with it though was light control; for solid picture quality you'd need to have the room mostly dark. So the idea of a living room projector just didn't seem plausible to me - ambient light is a problem. The Epson 8350 has proved me wrong though, even during the daytime the picture quality was solid for basic HDTV viewing and gaming. Obviously once the lights were off the picture really popped, but I was still shocked at just how well the 100 inch image looked on my wall during normal daytime use. Using a projector instead of a TV does mean there's a few things you need to set up differently. Most likely you'll need your devices hooked up through a receiver, this way you not only can switch between inputs easily, but the audio has somewhere to play. 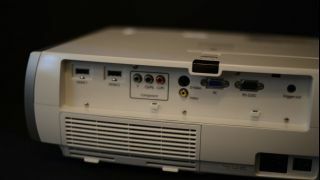 Since the Epson 8350 doesn't have speakers built in like a television you need to use something else for audio, this is typical of most projectors. 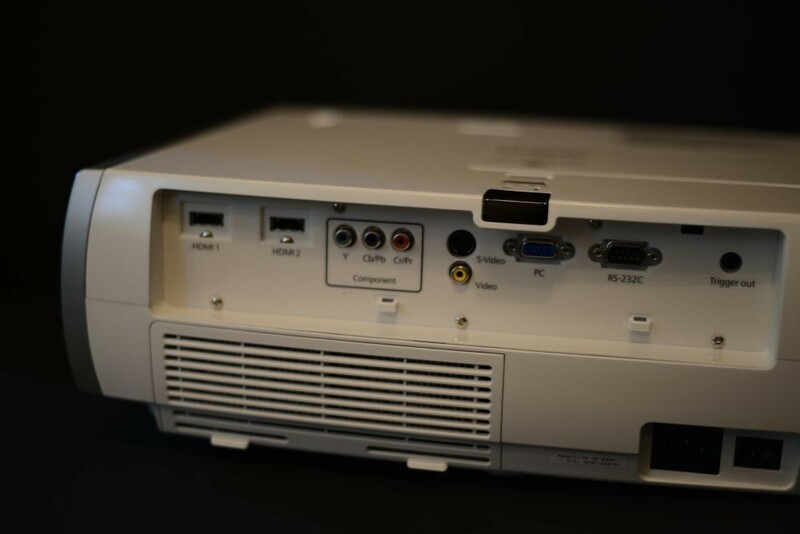 The Epson Home Cinema 8350 features two HDMI 1.3a inputs, a VGA input for computers, along with composite and component inputs. 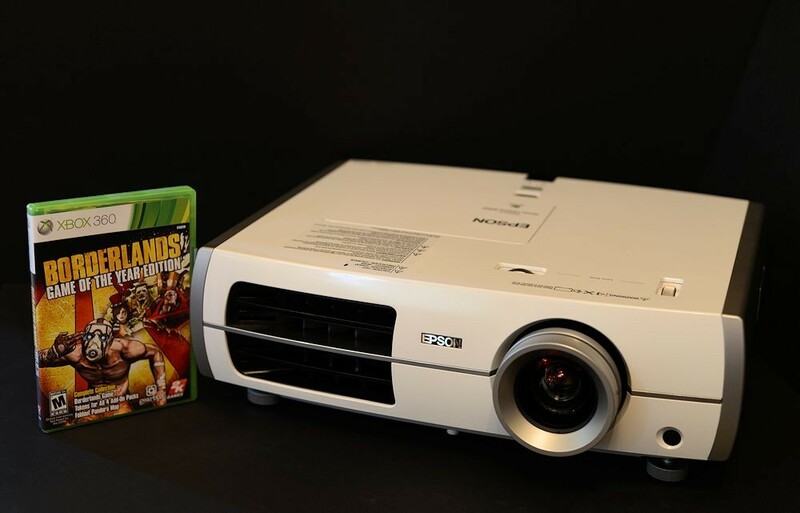 Its a native 1080p projector and supports varying resolutions and refresh rates up to 1080p/60. 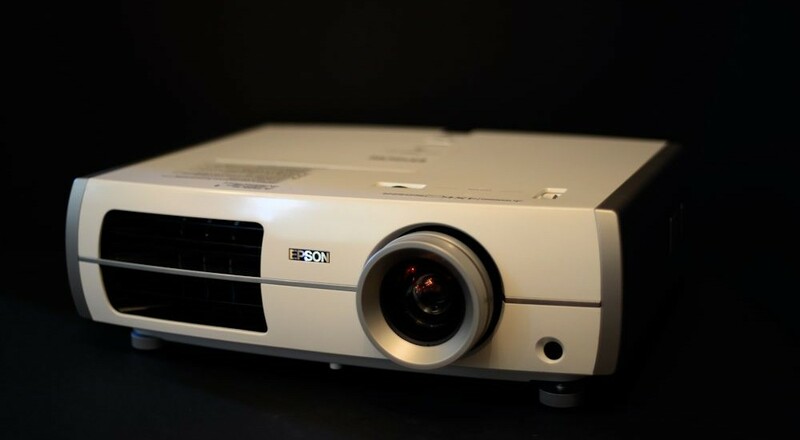 The biggest feature you'll want to pay attention to with projectors is brightness, and the Epson outputs light at 2000 Lumens with a average lamp life of 4000 hours. 1000 lumens is about as bright as a 75 watt incandescent bulb. Alright with all of that out of the way, how does it perform for gaming, movies, and television. As I said before the picture quality is really top notch, especially considering I was just projecting on an off-white wall in my living room most of the time. With the projector approximately 15 feet from the other wall I was able to get an incredibly large and clear image that was plenty bright at almost anytime of the day. The projector does a good job of letting you shift the image as well with two rollers on the top of the unit, allowing the image to be moved left, right, up and down to the exact area you want. This lets you set the projector on an existing table or shelf with relative ease. My living room has windows on every side and late in the day when we would watch content on the projector the sun was usually located around them. While the darks were washed out a bit, the picture quality was still more than acceptable. There's a handful of picture modes, one of which is called "Living Room." This bumps up the brightness for daytime viewing, but I didn't find it was required to watch. Borderlands 2 was easily as tall as me. Over the course of a month we watched Blu-Ray movies on it, with the recent release Oblivion being a highlight showing off the quality of the image. I also watched a Blu-Ray called Timescapes which features time lapse photography that was absolutely stunning. 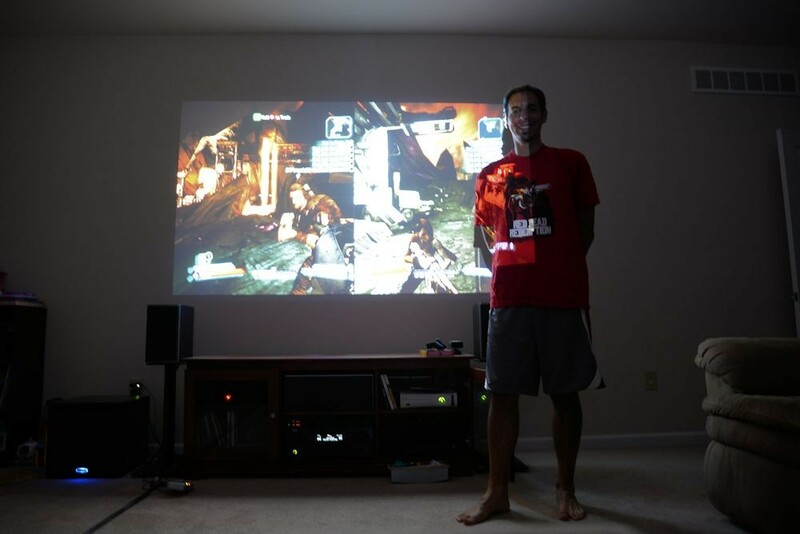 Gaming wise there's a huge benefit to a projector and couch co-op gamers. Your split-screen is absolutely monstrous. In Borderlands 2, each player view was as tall as I was, and in a game where there's a lot of text to read the extra size made it super easy. Disney Infinity looked great as well and it afforded us a nice place to put the portal and figures while we played. My daughter was definitely all in. Performance wise I didn't notice any controller lag or issues with screen tearing or blurring while gaming. I played around with the color modes built into the projector and found "Living Room" to provide the most punch for gaming itself. Colors, brightness and contrast just seemed to fit titles like Borderlands 2, The Last of Us, and Geometry Wars 2. For movies though I found "Natural" too look the best when I ran it through my normal movie test of a few scenes from Gladiator and The Fifth Element. 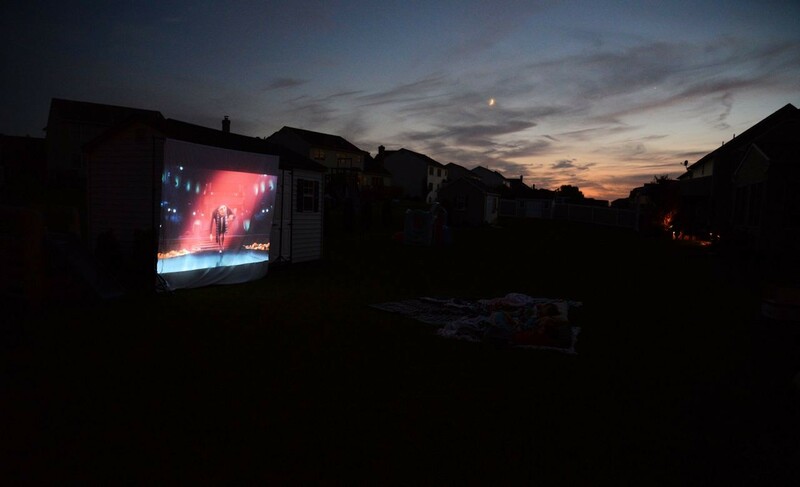 One of the highlights of using the projector was when a neighbor and I decided to have an outdoor movie night for our kids. We set up the projector in the back yard and I put up a screen from a photography muslin I had. The kids grabbed blankets and laid in the grass as we gave them a "drive-in" like experience of watching Despicable Me. They absolutely loved it, the picture looked great, and the adults had a good time. My neighbor already wanted to plan another night, except we'd be playing Madden NFL on the screen instead of a kids movie. One thing this setup afforded me was to see just how bright this projector is - it easily projected the image 20 feet and even beyond outdoors. Outdoor movie night was a success. A perfect summer evening. Another thing that impressed me with the Epson Home Cinema 8350 was just how quiet it was. My old Panasonic projector used to be quite loud, especially after extended use. But the Epson sat 2 feet above my head on the couch and it was barely audible - even after hours of gaming and movie watching. The bulb life is rated at 4000 hours, which equates to 166 straight days of use. Generally you don't get the full life out of a bulb and about midway through its life you start to see noticeable dimming, so that's definitely something to be aware of. 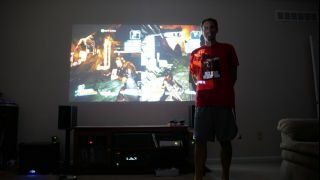 Overall I can easily see a projector like this at least adding to your home theater setup. Maybe you don't have to replace your TV, but at $1300 there's a pretty strong value to be had here. 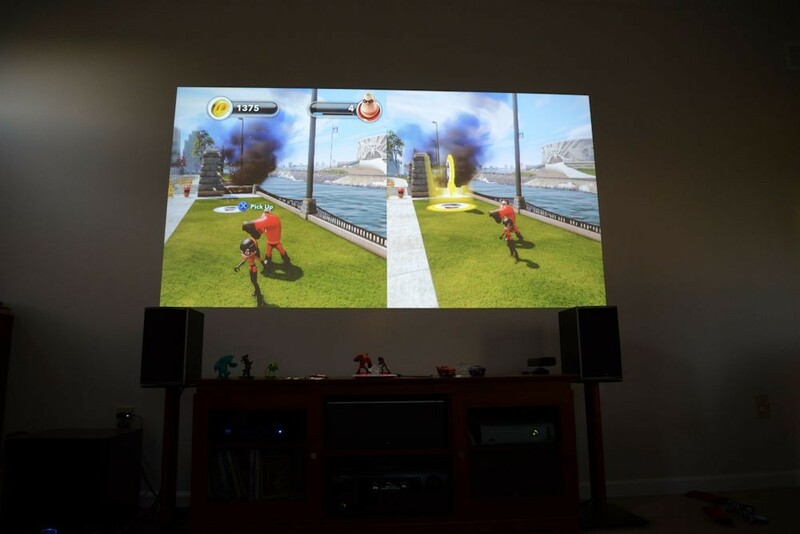 A projector is a great way to get folks together to game on a couch and not sacrifice screen real estate. 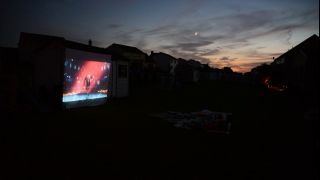 Having the flexibility (and portability) of a unit capable of creating a screen on any surface makes setting up events like movie and game nights for large groups of people incredibly easy. You'll find a wide range of projectors and pricing online, but be wary of their features. You'll want to pay close attention to resolution, throw distance, light output (lumens), and supported screen sizes. Another thing to pay attention to is how far you can offset the picture from the lens. 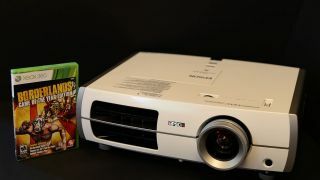 I found the Epson Home Cinema 8350 to be a solid performer in almost every category and an equally impressive feature set. Page created in 0.7556 seconds.